The 3k3y (“three-key”) modchip is a device designed to let PlayStation 3 owners execute “unsigned code” on their consoles. Technically “unsigned code” is defined as any code Sony hasn’t authorized you to run on your system. Publicly people proclaim this means things homebrew games and custom applications, but privately everyone knows they are primarily used to run pirated games. The only legitimate application for running games from a hard drive is to keep your kids from scuffing up your original discs, but regardless of how handy this might be, due to current DCMA laws, even this is illegal. You can run “unsigned code” on a PlayStation 3 by using one of two methods: either by running a custom firmware, or installing a modchip. The advantage that modchips like the 3k3y and its competitor the Cobra have is that they allow you to run the original firmware (OFW) versus custom firmwares (CFW). Custom Firmwares are easily detectable by Sony; running CFW and connecting your PS3 to the PlayStation Network (PSN) is a good way to get your console banned for life from online play. Additionally, to install a CFW you have to be running a specific, older OFW that, unless your PS3 has been sitting in a closet for a couple of years disconnected from the Internet, it’s unlikely you’re running. You also can’t downgrade firmwares on the PS3 without purchasing additional hardware (or paying some kid on Craigslist $50 to do it for you), and many newer PS3s aren’t even capable of running the older OFW needed to install CFWs. Long story short, if you’re not already running a CFW on your PS3, chances are you won’t be able to install one and a modchip like the 3k3y is your only alternative. When I hinted to Santa that I was interested in getting a 3k3y, he told me he had no idea what I was talking about and that I was on my own. So, I ordered one for myself to see if the chip lived up to the hype. Through the official website I found links to a US-based site selling both the 3k3y and its accessories, the 3k3y Remote, the 3k3y WiFi Adapter, and the 3k3y Ripper. The 3k3y itself is the modchip. 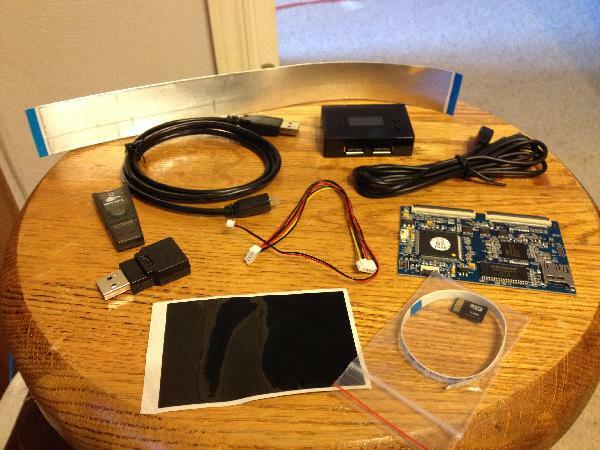 The Remote, WiFi Adapter and Ripper are all optional accessories. The remote acting as a tiny external screen offering status updates, the WiFi adapter allows you to remotely control the 3k3y, and the Ripper allows users to back up their own discs. Before ordering anything you’ll need to figure out which version of the 3k3y your PS3 needs: the PATA or the SATA version. For the most part FAT (original) PS3s need the PATA solution while slim PS3s require the SATA board, but there are guides online explaining exactly which PlayStation uses which drive connector. I purchased the PATA 3k3y and the Remote from the US seller; my credit card was processed in Belize, and the package was shipped from Canada. 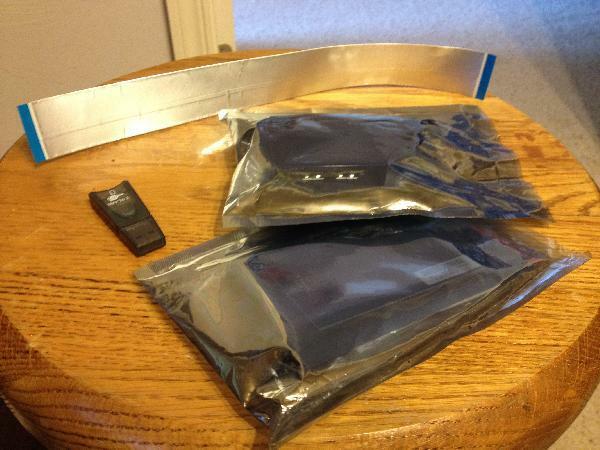 Once opened, the package revealed two static bags, a cable, and a miniSD-to-USB adapter. As is unfortunately becoming the norm, no physically printed instructions were included. All instructions, manuals and guides are included on the 3k3y website. The first document I attempted to use was the “3k3y Installation” PDF. Step one says to “Obtain your PS3 BD drive keys and copy it to the supplied 3K3y micro SD card.” After trying to figure out how to do that for 30 minutes I discovered (a) that you no longer have to do that as of firmware 2.0, and (b) since I’m running OFW (official firmware), I couldn’t even do it if I wanted to. On to step two! “Remove the rubber cover, retaining screw and decorative plastic cover from your PS3.” I removed the rubber cover — it came off in three pieces, which all went directly into the trash. The “retaining screw” was a special Torx-security screw, and even though I have a set of Torx bits the actual driver was too thick to fit into the hole. After multiple trips to the garage and back, I found a flat-tip screwdriver both narrow and long enough to dislodge the screw. Once removed, the security-topped retaining screw went directly into the trash next to the three pieces of the rubber cover. By the time I finished step two I had hit the one hour mark. The installation PDF includes 21 steps. I soon abandoned the official installation document and found the following unofficial 3k3y installation video on Youtube. Other than the repetitive music, this video is very good and showed me exactly how to install the 3k3y. Although the video comes in at just under 9 minutes, it took me another 90 to get everything wired together properly. Excluding power, the 3k3y has three ribbons connecting it to the PS3, the PS3’s drive, and the USB port on the front of the PS3 (the third of which requires you to physically cut a hole in your PS3 to run the cable from the inside to the outside). From personal experience, my advice to those installing a 3k3y is to not immediately re-seal your PlayStation 3. I’ve been back inside mine at least three times. With the 3k3y properly installed I was ready to test it out… or so I thought. The 3k3y allows you to play PS3 games in ISO format stored on an external USB device. I set out online to find an ISO of “No More Heroes,” a game I own. (I can’t rip my own games without purchasing “The Ripper.”) I quickly found that 99% of all PS3 games online are in “jailbreak” (JB) format. To convert a game from JB format to a usable ISO you’ll need to use “iSOtools,” an app on the 3k3y website. 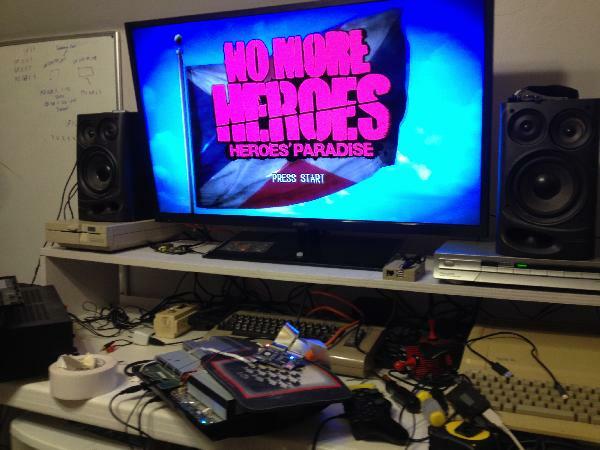 After downloading No More Heroes in JB format I had to unzip it and convert it into an ISO while applying an IRD file. IRD files are patches that turn JB rips back into something effectively resembling an original ISO. Each IRD file has to be downloaded individually from the 3k3y website, and not all games are available yet. If I had purchased the Ripper I could have ripped my own copy to an ISO, but when I read that I would have to disconnect my PS3’s optical drive and connect it to my PC each time I wanted to convert a game to ISO, I decided downloading them would be simpler. And while it may be simpler, it’s definitely more time consuming. The 3k3y operates in two modes: pass-thru and emulation. In emulation mode, the 3k3y emulates the physical drive, which is what allows you to load and play games from an external hard drive. Great! Pass-thru mode allows you to insert your own original game and play them like normal. This would be also great, except as of firmware 2.x, pass-thru mode is broken. Every time I turn my PS3 on with an original disc in the drive, it locks up and forces me to do a hard shutdown, which in turn forces me to run a scandisk. Every. Single. Time. I also feel compelled to mention that the single most useful tool for determining which mode your 3k3y is operating in, a blue flashing LED located on the 3k3y PCB, is not visible once you close your PS3 back up. The Remote relays similar information, but not as quickly. Even after downloading and preparing the ISO, I was nowhere near being able to run it. Next up was applying the frustrating system updates. My unit appears to have shipped with firmware 2.02, although I couldn’t figure out how to verify that. When comparing firmwares 2.02, 2.05, and 2.07, some of them seemed to have extra files, some were missing files, and the format of the configuration file changed. Somehow I got the wrong config file combined with the wrong firmware and ended up getting my 3k3y in a non-working state. Restoring the device back to stock was simple enough to do, thanks again to Google. Somewhere in the middle of all of this, day one turned into day two. There were multiple times throughout this project where I secretly hoped everything would quit working so I could dump the entire console into the trash, guilt-free. After two days of reading, online detective work, and plain ol’ trial and error, I got the 3k3y to load and run an ISO. 01. Create or obtain a compatible ISO image. Remember, to create an ISO from your own original discs you’ll need to purchase the separate Ripper PCB, connect it to your PS3’s drive, and also connect it to your PC via USB. If you download a PS3 scene release game from parts unknown, you’ll need to convert it to a compatible ISO format by using iSOtools and then patch the resulting ISO file with an IRD file — presuming one has been released (if not, you’re SOL). Keep in mind that some PS3 games are 40gb or more in size. Bring a sack lunch. Once you have a working ISO image, you’ll need to transfer it to an external USB device. 02. Turn on the PS3 with no disc in the drive. If you accidentally forget and turn on the system with a disc in the drive, your PS3 will lock up, forcing a hard power cycle and a mandatory scan disk upon reboot. 03. Disconnect/reconnect the 3k3y Remote from the USB port. I couldn’t find anything in the documentation suggesting this step, but unless I disconnect and reconnect the remote every single time I power on the system, it doesn’t work. 04. Insert an original PS3 disc into the system. If you’re running OFW, the 3k3y needs to obtain a legitimate encryption key from somewhere. 05. Using the menu system of your choosing, select the ISO you wish to insert into the virtual drive. There are three different ways to select the ISO you wish to play: using the optional Remote, selecting it from the PS3’s Photo menu, or by building your own custom menu and uploading it to the PS3. You can only enable one of the three methods at a time, and to change methods you have to edit a config file and reflash your device. 06. Go to the Game menu, select the game, and play. The most obvious step — play away! When you’re done playing, don’t forget the following two steps. 07. Using the remote, quit the game. If you’re using the original firmware, you’ve still got an original disc in your PlayStaton. If you shutdown your PS3 at this point you’ll end up with the original game still in your drive, which will (at least with the current firmware) lock up your PS3, forcing a hard rest/defrag cycle. 08. Eject the original disc. With the original disc ejected, you can now shut off your PS3. I don’t think I’ve ever got more mileage out of a mod than when I modded my Nintendo Wii. Not only does the Wii mod add the Homebrew Channel (allowing owners to add a slew of emulators to their system), but it also adds a GUI menu system that allows users to point at pictures of their games using the Wiimote in order to launch them. Anyone who has discovered their copy of Guitar Hero for the Wii has one too many scratches on it to spin up can see the advantage here. It’s one of the few mods that improved the functionality of a console. The PS3’s ck3y is almost the opposite. Installation was time consuming, documentation was sparse, and the process to launch games is so difficult that it’s unlikely either of my kids could pull it off. To top things off, the 3k3y actually removed functionality from my PlayStation 3 — I can no longer play any of my original game discs or movies, and unless I purchase the Ripper, I can’t back them up to my external drive. Q) Can I play PSX and PS2 ISO’s? A) This feature is currently being worked on and is in testing, NO ETA is provided so do not ask. I have since discovered that the playing of PSX games has been added. I tried one; it didn’t work. I don’t know if PS2 support has been added or not yet. I’ve been told not to ask. Bottom line: Although technically speaking the 3k3y does what it says it does (plays PS3 ISOs from an external USB device), the devil is in the details. A time-consuming ISO-making process, haphazard documentation, an incomplete firmware and a less than user friendly game launching experience currently make the 3k3y tough to recommend to anyone except people who are willing to do whatever it takes to avoid paying for games. The whole thing feels like a work in progress; in the 3k3y’s defense, the team has released multiple firmwares fixing bugs and adding features, so here’s to hoping the whole thing operates more smoothly in the future.